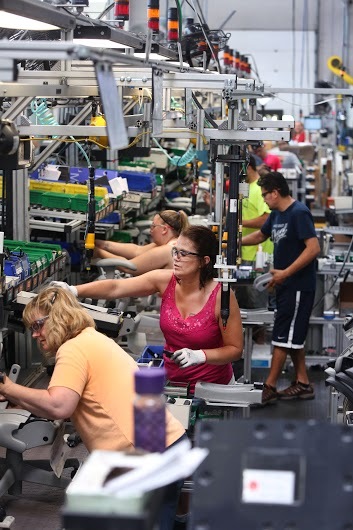 While the passage of the North American Free Trade Agreement 20 years ago produced seismic, at times painful changes for Michigan auto companies, the commercial furniture industry has flourished in West Michigan since the trade pact. Unlike Detroit’s Big Three, which all have a strong presence in Mexico, West Michigan manufacturing giants Herman Miller and Haworth have largely kept their operations stateside, staying close to their U.S. customers, even as the easing of trade barriers led to an increase in exports. Steelcase, the other member of the furniture Big Three, has taken a different path, opening plants in Mexico as it has shuttered some U.S. facilities. Miller was talking at the 2014 NeoCon expo in Chicago in June, the largest design exposition for the commercial furniture industry in North America. It’s the most important event for office furniture makers to broker deals and unveil their new products much as Detroit automakers unveil vehicles at the North American International Auto Show. The Big Three furniture companies dominate the conference with expansive showrooms, just as they dominate manufacturing in West Michigan, said industry consultant Michael Dunlap. The furniture companies employ more than 17,000 people and generate more than $4.5 billion in annual revenue. For all the companies’ strength, however, West Michigan has grown by diversifying its economy. Unlike southeast Michigan, which had faced criticism for being overly reliant on the automotive industry, West Michigan has prospered from job growth in technology, healthcare and other professional sectors, which offset occasional downturns in the furniture sector. An economic outlook released by the Upjohn Institute for Employment Research at the end of 2013 shows that the Grand Rapids metro area is supposed to experience 2.6 percent job growth this year. Last year, the Grand Rapids-Wyoming metro area surpassed the 1 million mark, marking the largest population growth increase in the state. When NAFTA was signed in 1994, it forced West Michigan-based manufacturers like Steelcase, Herman Miller and Haworth to rethink their production strategy. Grand Rapids-based Steelcase – among original supporters of NAFTA – has slowly shifted U.S. production to Mexico in recent years, including plants in Tijuana and Reynosa, and offices in Monterrey and Mexico City. Earlier this summer, the company told plant workers in High Point, N.C. it was phasing out production, eliminating more than 250 jobs and sending many of them to Mexico. Steelcase has consistently praised NAFTA, saying it allowed the company to remain competitive by qualifying thousands of its products for duty-free NAFTA status. Herman Miller and Haworth have used technological advances and lean manufacturing to offset higher domestic production costs and remain competitive. Inside Herman Miller’s Aeron chair factory in Holland one morning in June, some 250 workers busily worked 14 lines, producing about three chairs a minute – or nearly 500 chairs a day. Every worker has four or five tasks before they pass the product down the line. A “facilitator” rushes to help workers who encounter problems that cause the line to stop. The facilitator jots down the problem, helps the worker resolve it, then records how many seconds it took to address the problem. At the end of the day, the facilitator documents the number of stoppages and then works with each worker the next day to figure out what can be changed to avoid that problem from occurring again. It’s all part of the company’s lean manufacturing approach, coined the Herman Miller Performance System, adopted 19 years ago by Ken Goodson, who most recently was the company’s executive vice president of operations. Back then, he was president of the division that produced pedestal file cabinets. NAFTA was in its infancy and customers were just starting to realize how much they could save in the new global marketplace, said Eric VanDam, Herman Miller’s director of product operations. “There was demand from our customers for lower cost, shorter lead time, and (Goodson) was faced with a situation where if he wasn't able to meet those needs he was going to lose the business to someone else. Where that someone else would have been, I'm not entirely sure because we were able to head that off,” VanDam said. The path to competitiveness for Herman Miller came from a perhaps unlikely ally – Japanese automaker Toyota, famous for its lean manufacturing technique known as the Toyota Production System, or TPS. Goodson had a relationship with a Toyota supplier and asked the supplier to help make a connection. “Ken pleaded with Toyota to come in and assess Herman Hiller and to get started on that journey,” VanDam said. The supplier suggested Herman Miller send two top workers to train with it for six months to learn TPS. One day Goodson received a call that Toyota’s TPS guru Hajime Oba was in town and wanted to see Herman Miller’s plans for improving productivity. Oba took a brief look at Herman Miller’s plans and scrutinized every detail, finally coming up with a to-do list for the company to complete. The TPS method involves looking at every detail of production, from the height of the line, to the squeaky wheels on the containers workers use to move parts across the plant. Every second that production is stalled because of small inconveniences adds to production costs, VanDam said. After improving efficiency on pedestal cabinets, the company sought production savings on its iconic Aeron chair. In the early days of the new approach, the seating factory had three shifts, with 77 workers on the clock each shift spread across three production lines. Today, it takes one line to produce the Aeron chair, with 13 lines dedicated to other seating. Aeron production went from taking 82 seconds to build a chair to Aerons now being built in as few as 17 seconds, VanDam said. When Steelcase moved some of its operations to Mexico about five years ago, Herman Miller’s board asked the company to assess whether outsourcing would work for them. Outsourcing “has been reviewed a number of times, actually. I think it would be irresponsible of this organization if we didn't consider all of our options,” VanDam said. At Holland-based Haworth, representatives said the lifting of restrictive tariffs under NAFTA has bolstered business with its trade partners, most notably in Canada, said Phil Todd, director of sales support. NAFTA “really created a borderless market for us in North America,” Todd said. Haworth’s client base is different from its Michigan competitors, Todd said. Instead of appealing to a customer that invests in smaller ticket items like seating, Haworth sells larger pieces like cubicle systems to its largely governmental clients. These products are generally custom built and don’t ship as well over long distances. Like Herman Miller, Haworth has tightened production costs. Inside the company’s cavernous Holland plant, automated machines blare as they carry supplies from one end of the plant to the other, lessening the need for manpower to transfer the load. A vast majority of Haworth’s factory workforce is based in the U.S., though Haworth, like Herman Miller, also has facilities in countries where they sell their products. About 4,000 employees are based in the U.S. Another 2,000 are based overseas. Todd said the industrial furniture business is very competitive, noting that 40 percent of the industry is located within 20 miles of Haworth’s Holland headquarters. “By and large to do business in this industry, and play at the level that we play at, you've got to have a really robust distribution network,” Todd said. That means hiring the right people to design, produce and install products and work closely with customers; a complex dance that Todd said is not easily passed on to an overseas workforce that may be unfamiliar with the intricacies of the business. Dunlap, the furniture consultant, said the furniture companies are also inclined to stay put because West Michigan is home to more than 100 suppliers that provide material and services to the furniture industry. “It actually becomes inconvenient to move operations overseas,” he said. For Haworth, sticking around just makes business sense, for now. Support for this project comes from the International Center for Journalists.